Maybe you were lucky enough to hear Dr. Dale Cruikshank's talk on the Cassini mission at last month's meeting. In addition to discussing a lot of the images we've already been seeing on the web, he showed us some closer ones that most people hadn't seen, and discussed the implications of what the spectroscopic results have been showing. 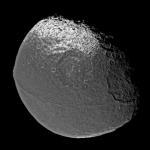 Some of the most spectacular images were not of Titan, not of Saturn itself, but of another moon: Iapetus. Iapetus is the strange Saturnian moon which has one very light side, made of ice, and another side which is dark from unknown materials. No one (yet) knows why Iapetus is like this. It turns out that the dark side of Iapetus is the leading edge - the side that goes first as Iapetus, tidally locked like our own moon, revolves around Saturn. The obvious implication is that Iapetus is sweeping up some sort of black dust that's hanging around in that part of Saturn's orbit - perhaps kicked off the intriguing dark moonlet called Phoebe, or perhaps from places unknown. The close-up pictures sent back by Cassini pretty well confirm this. But this is primarily a column for planetary observers, not armchair science readers. So what does this mean to you, the backyard observer? Well, your backyard 6" is not going to show you those fascinating streaks and white-rimmed craters that Dr. Cruikshank showed us. But you should be able to see the light side and the dark side, by comparing Iapetus to nearby stars in order to make magnitude estimates, like the AAVSO variable-star observers do. It just takes a little planning. It occurred to me that I'd never looked. Jane Houston Jones wondered about that, too, and has done the research to tell us when to look to see Iapetus' extremes. Iapetus has a long period - about 79 days - so this is a project which will take several months at minimum. I fired up XEphem with the Guide Star Catalog to take a look at the next eastern and western elongation dates. On the eastern elongation of March 15, with Iapetus' dark side pointed toward us, the actual time of elongation will be mid-day here, but Iapetus won't have moved much by the time it gets dark here. Compare the 11.9th magnitude dark side of Iapetus to a star an arcminute and a half to the northwest, at magnitude 12.75, another star about two and a half times as far in the same direction (the apex of a nice shallow nearly isosceles triangle with Iapetus and Titan as its bases) at magnitude 12.23, or Saturn's other moons Tethys (mag 10.3) and Enceladus (mag 11.8). The next western elongation, on April 24, unfortunately coincides with the full moon so chasing down tenth and eleventh magnitude objects is a little more challenging. Try looking early, when the moon is still low in the sky and Saturn is high. Worse, none of the stars near Iapetus are brighter than twelfth magnitude. Since Iapetus' bright side will be facing us, it should shine at about tenth magnitude, so you might be best off comparing it to Saturn's moons Rhea, magnitude 9.8, Dione, mag 10.2, or Tethys, 10.3. Iapetus is about eight arc minutes west of the rest of the Saturnian system. I'll post charts which should help in finding Iapetus on these dates, and details for some of the other dates Jane lists, on my web site. In other planet news: Jupiter is rising earlier, and is visible most of the evening, though it doesn't transit until after midnight, and it never gets much higher than 45 degrees. Mercury makes its best evening appearance of the year in the early half of March, reaching greatest elongation on the 12th. After that it sinks rapidly, but this is the best chance this year to catch Mercury in the few days that it takes to swell into a large but slim crescent before it disappears in the sun's glare around the 22nd. Watch it every day, and you'll be amazed at how fast it changes. Venus is too close to the sun to be observed this month, as are Uranus, Neptune, and Pluto. Mars rises a few hours before the sun, and is catchable by early risers. Finally, the end of March and beginning of April is a good time to look for the Zodiacal light. Look for a faint column of light rising up along the ecliptic just after the sky gets dark: this is light reflected from dust in the ecliptic plane, left over from the formation of the solar system.